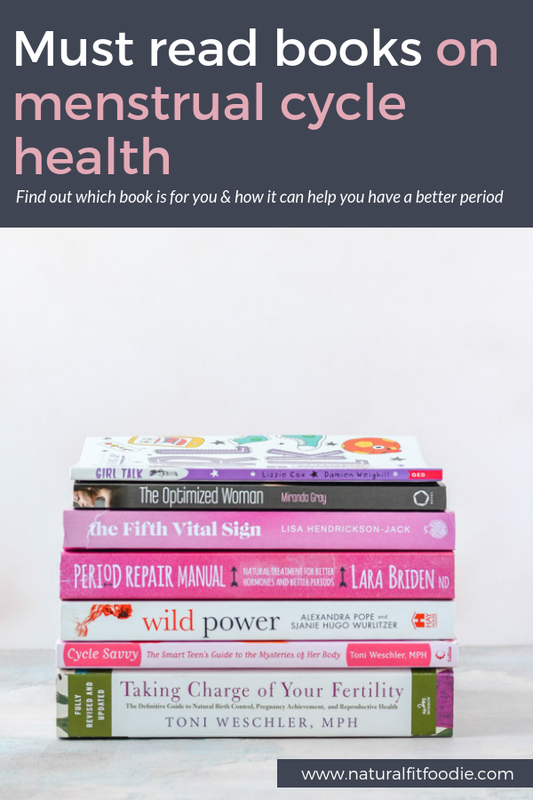 This compilation of the best books on Menstrual Cycle Health will help you get started on your journey to having a better period. If you’re a woman who wants to be more in tune with her body, to understand it better and start getting to the root cause of any period problems you’re in the right place. The path to healing starts with education and these are the BEST books on Menstrual Cycle Health to get you started. The list started off with three but has quickly grown. Author : Lara Briden – Naturopathic doctor with more than twenty years experience in women’s health. This book is for you if : you’re having period or hormonal problems and want an action plan specific to your condition. How will this book help me : The Period Repair Manual covers Period pain, PCOS, Endometriosis, Menopause, Ovarian Cysts, PMS, Acne and so much more. Lara Briden the author is a Naturopath and offers up several natural treatment protocols for better hormones and better periods. This book is for you if : you’re longing to live more in sync with your cycle. How will this book help me : Did you know that there are four phases to your menstrual cycle? Womancode teaches you how to cycle sync your life, that is how you can sync your diet, exercise routine, social calendar and even important work engagements to these four phases of your cycle. When you live in harmony with your body’s natural rhythms and hormonal fluctuations instead of fighting it you can naturally overcome the effects of hormonal imbalance and feel fantastic all month long. The Cycle Syncing lifestyle can help women overcome period problems such as PMS, Hormonal Acne, PCOS and more. Author : Toni Weschler – MPH, holds a master’s degree in public health and is a nationally respected women’s health educator and speaker. This book is for you if : you’re looking to learn more about your fertility and how to facilitate or prevent pregnancy naturally. How will this book help me :Taking Charge of Your Fertility will literally give you your womanhood! What do I mean by that? Well let’s just say that this book will help you understand how your body truly functions. You will learn stuff about your body that you should be taught from a very young age but most likely were not. After reading TCOYF you may find that ‘problems’ you thought you had are actually just a normal function of the female physiology. This foundational knowledge will help you gain better control of your gynecological and sexual health. Taking Charge of Your Fertility is truly an invaluable resource for body literacy and the Fertility Awareness Method. I think this book is a must for every woman however beware because no information is spared it makes for a much ‘heavier’ read than Womancode. This book is for you if : you’re ready to discover the magic of your menstrual cycle and awaken your feminine path to power. How will this book help me : There can be a lot at play when you’re having period problems and one major issue that I see time and time again with my clients is having a huge disconnect from the menstrual cycle. Wild Power is a guidebook on how to break that disconnect and become the woman you always knew you were. This book is for you if : you want to create life success in a female optimized way. How will this book help me : If you’ve ever felt like having a period was holding you back from being successful this book will radically change the way you think about yourself and how you live your life. The Optimized Woman is a self coaching guide specifically designed to help women become aware of their Optimum Times and associated abilities so you can apply them to achieve your goals. This book is for you if : you’re a woman with the goal of improving your menstrual cycle and optimizing your fertility. How will this book help me : With chapters on how to chart your cycle to different forms of natural birth control, to using your cycle as a diagnostic tool for health, The Fifth Vital Sign is like a how to guide for the menstrual cycle. This is one of those book that I recommend to EVERY woman. This book is for you if : If you’re on the pill, recently off of it, or just thinking of getting off and would like a smooth transition. How will this book help me : Beyond The Pill gives you the exact, easy to follow steps to restore hormonal balance and reclaim your health post hormonal birth control. This book is for you if : you’re a teenager or caretaker of a teenager. How will this book help me : Cycle Savvy is the Smart Teen’s Guide to the Mysteries of her body. It will help you make sense of your cycle and teach you exactly what changes are happening in your body as you move through puberty and beyond. This foundational knowledge will demystify your menstrual cycle and help you to make better, smarter decisions when it comes to your health and any period problems you may encounter. Author : Lizzie Cox – freelance journalist and former digital editor of a teen lifestyle and entertainment brand at Hearst UK. This book is for you if : you’re a tween or caretaker of a tween. How will this book help me : Girl Talk (Growing Up) is full of interesting facts and information regarding all aspects of puberty, rom periods to body shaming, to cyberbullying. It’s written in a fun and easy to follow manner with exciting illustrations to make it more interesting for young girls to understand. My ten year old daughter and I are quite enjoying reading this book together and I highly recommend it.